Plantain and chicory are often overlooked as forages for dairy and sheep. But their potential in boosting performance can have a significant impact on a unit’s bottom-line profitability. Farmers Guardian reports. Dry conditions this spring and early summer have seen a rise in seed sales of plantain and chicory due to their drought tolerance. Sinclair McGill’s grass seed manager Ian Misselbrook says: “Forage plantain and chicory are popular in New Zealand, both as straight crops and in grazing mixtures. “Many UK producers could take advantage of these ‘hidden gems’ that can extend the grazing season, improve the supply of minerals and trace elements, and boost liveweight gains when it comes to raising youngstock or finishing lambs. Forage chicory will reach full production in 14-16 weeks. It is then best rotationally grazed every five to six weeks to prevent flowering. Recovery post-grazing is rapid and the crop is a rich source of trace elements and minerals and does not produce any bloat problems – it will even tolerate low pH soils of 5.0. 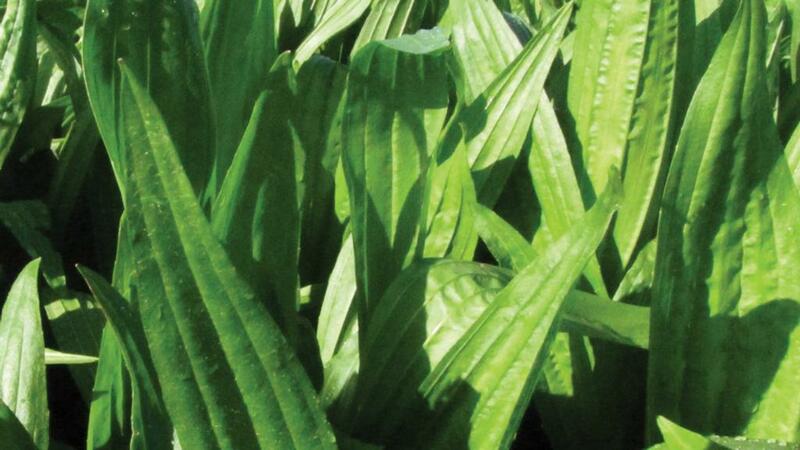 Plantain should not be grazed until the plant has six fully grown leaves. By then the root system will be fully developed. Like chicory, forage plantain can be rotationally grazed and provides a highly palatable feed rich in minerals, especially calcium, sodium, copper and selenium. Trial work carried out by Dairy NZ compared intakes and milk production of groups of cows grazing a typical summer rye-grass with 9.6ME, leys with between 20 per cent and 40 per cent chicory and leys with 20-40 per cent plantain. Cows in the latter two grazing systems had intakes 6 per cent above those on the rye-grass ley with 17 per cent greater milk solid yields. When pasture of higher dry matter was compared with chicory and plantain mixtures there was no difference in milk production. “This work demonstrates the benefit of plantain and chicory in a grass mixture as a longer term crop option that can withstand drier conditions, is easier to manage and offers flexibility,” says Mr Misselbrook. UK trials have shown ewes and finishing lambs will selectively graze both plantain and chicory in a mixed pasture. The performance of ewes with triplet lambs aged between nine and 10 weeks old and grazed on Tonic plantain was also compared in New Zealand work with ewes and twin lambs on grass and on lucerne leys. The average lamb weight at finishing in the lambs on the Tonic leys was 37.5kg, compared with 31kg and 32kg respectively for the lambs on the lucerne and on the grass. Plantain and chicory are easy to grow and can be established on a range of soil types, but a free draining soil is preferable. Sowing is best through spring and up to and into July providing there is enough moisture in the soil, and at a depth no greater than 10mm.